Tattooed Soldier is one of those roller coaster type of books that from the very start you get hooked! Even before you know what the story is really about you start feeling for the main character Antonio and his rent situation because living in Los Angeles we've all felt the stresses of rent then you really start diving deep into the murky waters of what is Guatemala in the 80's and LA in '92. Antonio Bernal is a Guatemalan refugee in Los Angeles haunted by memories of his wife and child, who were murdered at the hands of a man marked with yellow ink. In a park near Antonio's apartment, Guillermo Longoria extends his arm and reveals a sinister tattoo—yellow pelt, black spots, red mouth. It is the sign of the death squad, the Jaguar Battalion of the Guatemalan army. This chance encounter between Antonio and his family's killer ignites a psychological showdown between these two men. Each will discover that the war in Central America has migrated with them as they are engulfed by the quemazones—"the great burning" of the Los Angeles riots. 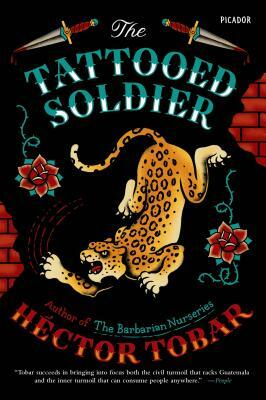 A tragic tale of loss and destiny in the underbelly of an American city, The Tattooed Soldier is Pulitzer Prize–winning reporter Héctor Tobar's mesmerizing exploration of violence and the marks it leaves upon us. Héctor Tobar, now a weekly columnist for the Los Angeles Times, is a Pulitzer Prize–winning journalist and a novelist. He is the author of The Barbarian Nurseries, Translation Nation and The Tattooed Soldier. The son of Guatemalan immigrants, he is a native of the city of Los Angeles, where he lives with his wife and three children.